I'm a big believer in mixing styles - antique and new, high (investment piece) and low (IKEA)... Another twist might be to take a traditional design style and make it out of modern materials, like metal. An obvious example is a four poster bed. What could be more traditional than that? But we see it in metal, and it looks fresh and modern. 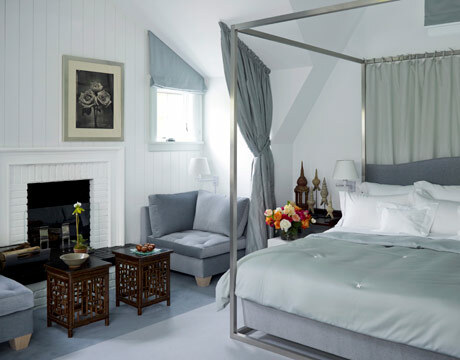 This bedroom designed by Vicente Wolf (one of my favorite 'mixers') uses cool blue-grey tones, a touch of Asian with the small tables, and a metal four poster that gives the room a traditional element, but with a twist. In my own home, I have tried to follow similar rules. I have a metal four poster hung with a piece of African kuba cloth, along with a 17th century leather embossed screen (to the right), and a large metal candelabra for some drama. I have a Chinese table for that touch of Asian in front of the leather and metal sofa. Many items were purchased at auction, of course! Doyle New York has an auction coming up February 8th, titled 'Belle Epoque". 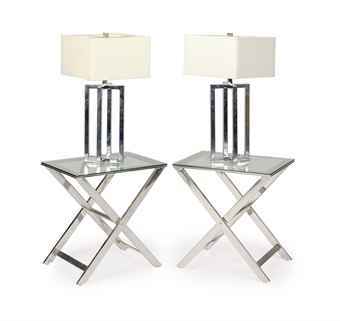 This pair of console tables caught my eye. They are described as Louis XVI style in silvered metal. I think these would be very smart in an entryway, or maybe one in the entry and the other in the dining or living room. Wouldn't one of these make a great bar set up area. They are Lot 130, measure 32 inches tall, 48 inches wide and 16 inches deep. They have an auction estimate of $1,000 - $1,500. They are very modern traditional! 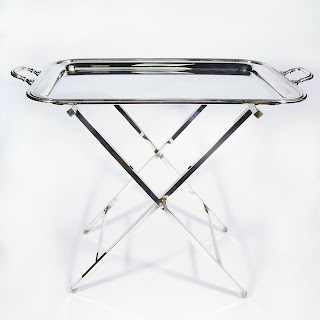 The same auction includes this Italian silver plated tray on a chrome folding stand. This is a classic style, and very functional. This would also be a wonderful bar set up in a living room. This is Lot 248, and has an auction estimate of $500 - $800. It's very sleek. Kamelot Auctions in Philadelphia often has intriguing pieces. 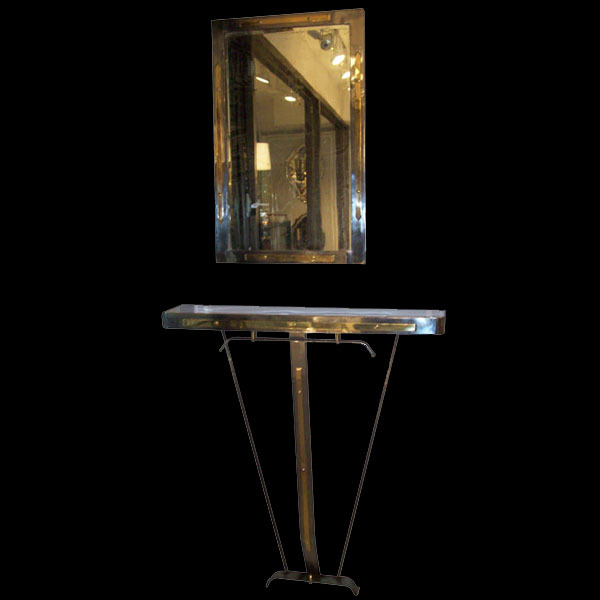 I like this modern console table and mirror in steel with brass decoration included in their next auction February 18th. These are in two separate Lots (205 and 209), but they really go together! They each have an auction estimate of $300 - $500. I think this set would make the perfect instant entryway with a classic but modern feel. Add some frilly sconces on either side of the mirror for a chic first impression. By the way, Kamelot also has an identical pair of console tables as the ones in the Doyle auction with the same auction estimate. At the next Christie's Interiors auction in New York February 7th and 8th, this pair of side table and lamps are offered in Lot 657. They are made of chromes metal, and the tables have glass tops. These are not quite modern twists on traditional, but they are sleek, and would fit in to modern or classic designs. They have an auction estimate of $1,000 - $1,500. 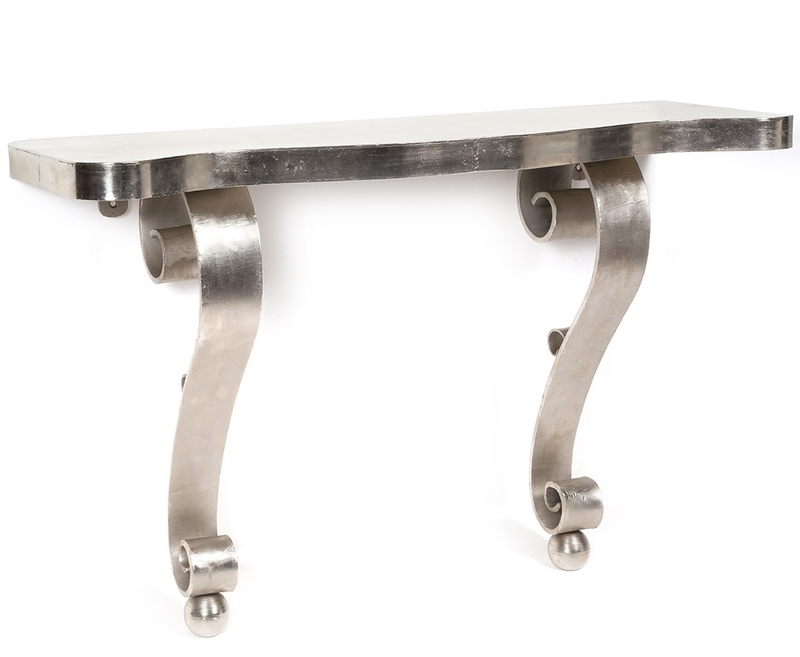 Add some chrome in a classic style and you have a piece that will jazz up your room some modern elements without going too wild!